Hawaii is one of the world’s most beloved and popular vacation destinations. Tourism reigns supreme on the islands, and visitors flock there year-round to enjoy its aloha spirit. So you might think Hawaii would be teeming with theme parks and amusement parks, right? People are often surprised to discover that there are no major theme parks on any of the islands. You can ride plenty of waves, but if you want to ride a roller coaster, you’re out of luck. You can visit Mickey Mouse on the tropical islands though. 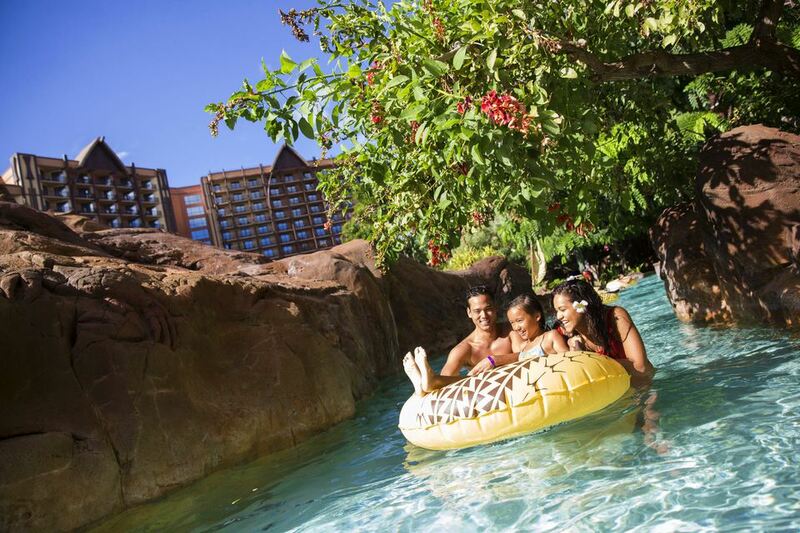 Disney’s Aulani Resort has some elements of a theme park and a water park. But it is really first and foremost a resort, with some extraordinary amenities. Let’s run down Hawaii’s lone water park along with some of the attractions that have park-like qualities. All of them are located on the island of Oahu. Don’t come expecting fairy tale castles or yo-hoing Pirates of Polynesia. Aulani is not a theme park, and it doesn’t have any of Disney’s signature rides. It is, however, a wonderfully luxurious resort—perhaps Disney’s best. Located in the relatively remote vacation and residential community of Ko Olina, the stunning property is far from the hustle and bustle of Waikiki and Honolulu. If you are looking for a unique, high-end hotel on Hawaii that only Disney’s Imagineers could have crafted, you should be delighted by Aulani. It has virtually everything that any of the islands’ finest resorts would offer — incredible ocean views, a lovely beach, posh rooms and amenities, exquisite dining — plus Disney’s legendary flair for design, decoration and storytelling. Among the Disney-esque touches are a nice collection of water park attractions, a supervised kids’ clubhouse that is included in the room rates, a coral reef adventure experience, and character meals with Mickey and the gang. Aulani also offers what may be Hawaii's best luau. The all-you-can-eat food is scrumptious, and the show is delightful. About half of the resort is devoted to Disney Vacation Club, their take on a timeshare. The rest of the resort consists of hotel rooms and suits, though the general public can book the lovely DVC villas when they are not occupied. Hawaii's only major water park has a nice assortment of attractions, including a large wave pool, a family raft ride, a funnel ride, a bowl ride, a nicely-themed lazy river, and mat-racing slides. For little kids, there is an interactive water play center and a kids’ sprayground. Although Hawaii may be the world’s surfing headquarters, you could try your hand on Da Flowrider, a simulated surfing ride that challenges riders on boogie boards to tackle its steady stream of artificial waves. Wet’n’ Wild also offers mini-golf and a cafe. After the sun sets, the park features a luau. It's not a theme park, but with its pavilions representing the Pacific islands, the Polynesian Cultural Center does have echoes of Epcot. One of Hawaii’s most popular attractions, the center invites visitors to explore the traditions and cultures of Hawaii, Tonga, Tahiti, Fiji, Samoa, and New Zealand. Native people preside over exhibits and participate in presentations, some of which include guest interaction, that include music, dance, crafts, and food. They also share customs, rituals, and the history of their islands. Among the attractions is the large-screen, Imax film, "Hawaiian Journey," which is one of the center’s highlights. There are also boat rides, an exhibit about ukuleles, the Polynesian Football Hall of Fame, and a marketplace with shops and restaurants. In the evening, the PCC presents a luau, which includes both a buffet meal and a show that features “fireknife” spinning, hula dancing, and music. After the luau, the center presents “Ha: Breath of Life,” a show that incorporates music, dance to depict life on the Polynesian islands. The Church of Jesus Christ of Latter-day Saints operates the attraction (as well as the nearby Brigham Young University). Since Mormons abstain from alcohol, no hard beverages are served throughout the PCC. If the Polynesian Cultural Center is like Epcot without the rides, Sea Life Park is like SeaWorld without the rides. General admission includes exhibits and shows featuring sea lions, dolphins, sharks, penguins, and sea turtles. There is also an aviary, a reef lagoon to explore, a touch pool for hands-on encounters with animals, and a seabird sanctuary. Sea Life Park offers many extra-fee experiences, such as swimming with dolphins, sea lions, or rays as well as a scuba dive with sharks. It also presents a luau that includes activities such as lei making and hula lessons. At one time, it was possible to ride a roller coaster in Hawaii. The five-acre Aloha park, which was also known as Waikiki Park, opened in 1922 and closed in the 1930s. Among its rides was the Big Dipper, a wooden roller coaster. Other attractions included Dogems bumper cars, a walk-through Noah’s Ark funhouse, a carousel, and a small railroad.